Welcome to the first stop aboard Magical Blogorail Red. Enjoy the ride as we share with you the ways we celebrate Disney at home. Unless you live in Central Florida or near Anaheim it's pretty hard to make it to the Disney Parks as much as you would like. Here's your dilemma...How do you get your Disney fix from home? Well, at the Anderson household we like to enjoy a Disney Movie night. We watch a favorite Disney Movie and I prepare a dinner themed around the movie. 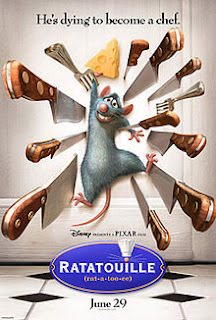 A favorite of Mike's is Ratatouille, so it's pretty easy to go with a French theme and channel my inner Remy to cook a Ratatouille for the family to enjoy. 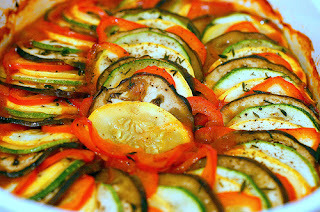 It's full of great summer vegetables and the kids will love eating the same thing Ego enjoyed at Gusteau's. Add some French Bread and cheese to the mix to make the meal even more authentic. Don't forget the French Pastries (maybe a chocolate croissant) for dessert. Don't let the Ratatouille intimidate you, remember Auguste Gusteau's philosophy... "Anyone can cook." Thank you for joining me today. Your next stop on the Magical Blogorail Loop is The CanaDisney Blog. Interestingly, I don't do many Disney movies anymore, but building an appropriate meal menu around the theme is such a great idea. Maybe it's time to do that; thanks. Thanks Bruce, I am going to have to try exploring the parks via Google Earth, thanks for the idea!! I'm big on doing Disney movie nights. We do a themed meal, too, along with decorations, a craft and/or game. Isn't it fun Christina!! My husband is a big Pixar fan, I don't get to watch many Princess movies on movie night, I miss having a little girl!! It is definitely so much fun! We love it. Honestly, I can't believe we haven't done Sleeping Beauty (one of my daughter's favorites) or Snow White yet. Or Cinderella... I think because everything else we do has to do with princesses, I try to do something different during movie nights most of the time. haha I need to fix that. :) We need to do some Pixar movies, too.